Eastern Mennonite University professor Carolyn Stauffer has been awarded a JustPax Fund grant to support the development of a new Strategies for Trauma and Resilience (STAR) curriculum focused on sexual harms. Contributors to the “Changing the Narrative on Sexual Harms” (CTN) project include STAR trainer Katie Mansfield, program director Hannah Kelley and practitioner Joy Kreider. The project will be housed under the STAR program at EMU’s Center for Justice and Peacebuilding. 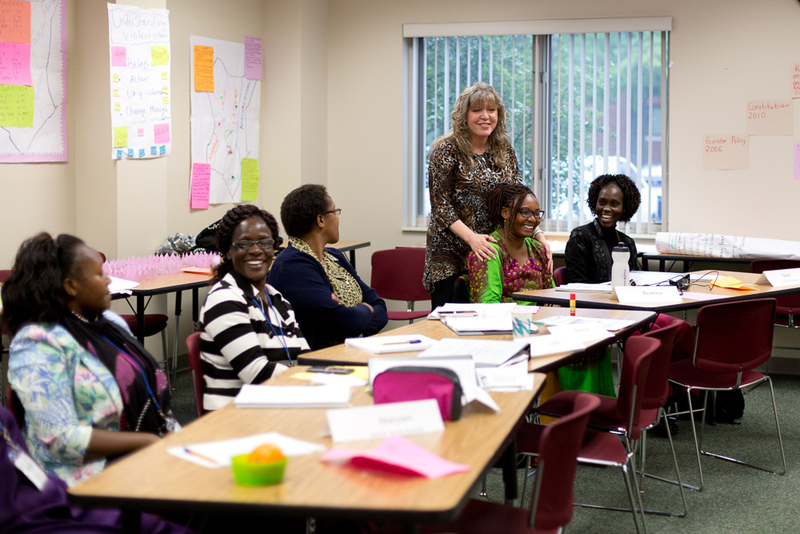 STAR has facilitated trauma and resilience trainings with thousands of participants from more than 60 countries. The CTN project and resulting curriculum will deepen the program’s work addressing sexual trauma specifically and will engage all affected parties – from individuals to institutions – in proactive, preventative and restorative approaches. 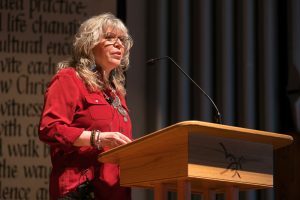 Carolyn Stauffer, an Eastern Mennonite University professor who teaches in the applied social sciences and graduate biomedicine program, speaks during a fall 2017 convocation. The grant includes funding for assembling focus groups in local and international settings, interviewing global practice leaders, and accessing expertise at institutions such as Victoria University in Wellington, New Zealand. The project will collect input from survivors across diverse communities to ensure the inclusion of voices from marginalized and underrepresented communities. In addition to the harmful impacts of sexual violence on individuals, the curriculum will address how power disequilibriums can foster cultures of violence in communities and organizations. The JustPax Fund focuses on individuals and organizations working for effective change through innovative approaches to societal challenges relating to gender, environmental and/or economic justice. It is administered by Everence Charitable Services through the Everence affiliate, Mennonite Foundation. This $6,600 grant is the second Stauffer has received from JustPax. A 2016 grant of $10,200 supported a project called “Silent Violence,” which studied strategies of resilience among domestic violence survivors from within communities of homeless women, undocumented Latinas, and Mennonite women from Old Order or conservative church communities.